Looking for a job can be a nightmare, but a little advance preparation can make the process a little more bearable. People in search for a technical position now have a handy iPhone application—Interview Questions from Martin Reddy—that can help with that pre-interview preparation. Pop Quiz, Hotshot: Tapping Interview Question’s Answer button gives you an example of how to answer a particular question—though not every question in the app offers this feature. Interview Questions is largely geared toward technical jobs, with questions that focus on programming (C/C++ and Java), databases, and networking. However, the app’s Personal section can come in use for anyone looking for any kind of work. When you first launch Interview Questions, you have the option to start an interview or browse the questions. Browsing shows all of the questions contained within one category. In the Interview Me! mode, all of the questions are randomized from all of the categories. Interview Questions sports a couple of interesting buttons at the bottom of each screen. Tapping an answer button gives you an example of how to answer the question, though not all the questions off this example. Another button shows you a Wikipedia reference for some of the technical terminology, if one is available. A Notes button gives you the ability to add notes on how you would like to answer a question. 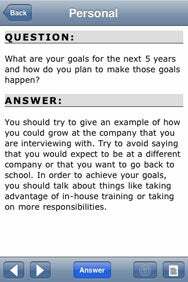 For example, you might take Interview Question’s example answer and tailor it to be more personal. This way, you can continue to practice or have someone else read the questions to you in a play interview. Interview Questions has plenty of room to improve. While doing a mock interview, you do not tell the software what type of position you are applying for. Therefore you are given random questions from all of the categories, including SQL, networking, and programming—not so helpful if those topics have nothing to do with your job search. I would also like to see this application expand its focus to other categories. Finally, Interview Questions could give more hints and ideas in its answers for questions—especially for questions that don’t have a suggested answer. I was expecting more from the app, given the price tag. Interview Questions is compatible with any iPhone or iPod touch running the iPhone 2.x software update.